If you have a yen for shoes, then the name Jimmy Choo must surely ring a bell. This luxe leather goods brand offers shoes for men and women, along with handbags, accessories and other fine goods. Beloved of Hollywood celebs, the glitterati and fashionistas everywhere, the brand has a sizeable presence around the world. 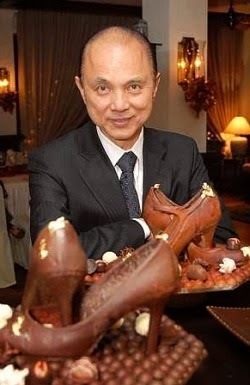 However, not many people are aware that the house of Jimmy Choo has a strong Malaysian connection as it is named after Dato' Jimmy Choo, OBE, who was born Choo Yeang Keat in Georgetown, Penang in 1961. Choo learned the art of shoemaking from his father, who insisted that the youngster watch and observe for a while before rushing off to make a shoe. After apprenticing with his dad Choo went to Cordwainers Technical College in Hackney, London to hone his craft, he graduated in 1983 with honors. Soon after graduation, he opened a small outlet in Hackney turning out exquisitely made shoes. He soon caught the eye of the fashion fraternity and was featured in a eight-page spread in British Vogue. His shoes came to be favored by those in the know, including Princess Diana who seemed to wear her Choos everywhere. Choo’s association with Vogue brought him into contact with the magazine’s accessories editor, Tamara Mellon, who suggested they partner and launch the Jimmy Choo, ready to wear brand. The brand was a runaway success and soon expanded to include handbags, accessories and fine small goods with a focus on high-end shoes. The brand came to be stocked at all the leading retailers in the world like Harrods, Bergdorf Goodman, Sak’s Fifth Avenue, Neiman Marcus etc. However, in spite of the brand’s tremendous success Choo was not happy, for he felt that his craft was being diluted, as factories were now making the shoes, he used to make himself. Choo’s unhappiness led him to fall out with Ms. Mellon and he went on to sell his half of the company to Robert Bensoussan of Equinox Luxury Holdings for $30 million in 2001. After the buyout, Jimmy Choo returned to his small store in Hackney, from where he handcrafts a few pairs for the high-end Jimmy Choo couture line every week, while imparting shoe-making training to students of the trade. So next time you pick up a pair of Jimmy Choos, spare a thought for the venerable Malaysian in Hackney, the man behind your shoes.